Agreeing with Kurt. Especially the Forest Temple. I actually restarted my entire game because I thought I was stuck because I got the Iron Boots right after becoming an adult and thought I used a key somewhere early because I skipped a section with the boots and was out of keys and screwed myself over or something. Turns out I just missed a key. Plus, Phantom Ganon was the first boss to kill me in the game. press A...press A...press A...press A...press A...aw crap! And does anybody remember the part where you have to trap a blue flame in a bottle, knowing absolutely nothing (including common sense) pointed to you being able to do that? I lost hours on this, I thought I missed an item. I thought I was the only one! God that frustrated me to no end. The original Ocarina is still a great game tho, tons of memorable moments. @Simbabbad I can't say I experienced that, since at the time I played most games using a player's guide That sounds frustrating though. Other than updating the graphics and maybe adding more stuff to the battle system so it's more like Wind Waker and Twilight Princess and being able to toggle items (like the iron boots) on and off really quickly, I can't think of much of anything else I would want fixed. 12. Better Graphics. (this is a given). These are good, but I don't expect too many changes in the 3DS port. Seriously though, my love for OoT knows no bounds. Maybe because it was my first Zelda, who knows. But 6 replays can't be wrong. umm... aside from graphic improvements... i want them to make the combat more interesting and challenging... maybe spruce up Hyrule field with some visual interest or activities... and add a more difficult (and rewarding) sidequest... how about dual swords ala the Gerudo guards, or Pegasus Boots to replace the normal boots for faster travel? The one that could have been..
How about longer days and nights? I thought it was nuts that it took an entire day to cross Hyrule field. Probably the Ocarina of Time beta or whatever. It'd be cool to see some of the stuff that didn't make it into the final game in the 3DS version. I don't think there was anything broken with the game itself, however I would be all for control improvements implemented since Wind Waker including camera movement and parry/dodge moves. They can balance these by making the enemies harder to beat or even adding a super guide for the Zelda newbies. I would like to have the Master Quest unlocked after you beat the game for the first time, including being able to ride the young Epona when you travel back in time. They could also add horseback fighting mechanics from Twilight Princess, along with a timed event that could be used to follow Ganon's horse and maybe introduce a third Ganondorf battle because 2 aren't enough. I would upgrade the rabbit mask to its Majora properties, essentially introducing Pegasus shoes in Ocarina of Time. That was a ton of fun. Finally, I would make sure this time around the music was fully orchestrated (I love the Hyrule Symphony compilation) and some older tunes might be introduced when you play the game on Master Quest (the classic Zelda overworld theme could be used for Young Link and the Dark World theme could be used for Adult Link, all in full orchestration glory). I don't find anything wrong with the Forest Temple. I really dig the design - the ancient, worn monolithic structure - of it. Your other ideas are good. Improving the relationship between Link and other NPCs, especially the Sages, would improve the game. As for some of my ideas, I have them down in the other thread. But basically Nintendo should probably take the time to make a proper remake to OoT instead of just another port. We've already had tons of ports of OoT; they should give us a new adventure in the likeness of OoT. IGN-US has its own OoT Remake article. I'm not opposed to any of the ideas presented in both of these articles. Actually a tweaked game sounds like a good idea. So I feel the need to comment. I agree with them here. Updated textures and models would be a good idea. Also updated special effects are going to be necessary for 3D, so I hope they take the time to update the other little things for 3D and overall better IQ. They will obviously need to be changed to cater to the DS's abilities. A straight port would be lazy. They need to be intuitive and creative, and perhaps this will help them import new items. I like their idea to give the Skull Kid more information as well as throwing nods to Majora's Mask. That is goosebump-entailing like seeing Mario in Hyrule Castle. I think a good way to handle explaining some of the other NPCs, like Gaebora, is to add more secret rooms and caves. They can kill two birds with one stone by putting these extra places in Hyrule field. I loved Hyrule field when I first got to it, but it is indeed way too barren. A few houses or shacks, caves, or something like a trading post would make it feel much livelier. There are some spots I have in mind for this thing too. To the "left" of Hyrule Castle gate, when you approach it from Hyrule Field, is a good place they can expand. There's a whole lot of nothing worthwhile between Hyrule Castle and the entrance to the Gerudo Valley. There's that little plot of land on the other side of Zora River that can be home to something awesome. Hell that could be a good place to add another complete area or dungeon. A water wheel mill would fit either here or in between Hyrule Castle gate and Kakariko Village. An awesome wish I've always had was for the ability to travel Zora's River from Zora's Domain all the way to Lake Hylia in one continuous ride. I've been fantasizing about this since the first time I beat Ocarina of Time and I want this included so badly. It would make the entire overworld feel much more connected. Also I think it would be nice if they somehow tied the tiny stream in Kokiri Forest to Zora's River. There is that little pool of water that branches into the river and it's right next to the Kokiri exit. There should also be some kind of stream (or strams) flowing from Death Mountain. Perhaps they can tie it into Kakariko Village and the well. Where the river goes into the solid rock on its way to Gerudo Valley is a good place mimic what they did in Twilight Princess. Insert some kind of tunnel or cavern there. I definitely want to be able to traverse the river on its entire course through Gerudo Valley onto Lake Hylia, instead of having the warp effect.. The Zelda team could put some platforms for us to stop at in the valley cut by the rive, and it would be awesome to use the hookshot (perhaps double hookshot) to climb the rock faces of the valley. This would be a good area to hide secrets, and in my mind it would be reminiscent of Death Mountain in A Link to the Past. We're also going to need another item or something to travel the river. Like... THE RAFT! Although I think a good idea would be to have posts set up along the river where you can purchase or borrow a raft or boat. This would make Hyrule Field much livelier, and again tie together the sections of the overworld by having a single company set up water travel posts in different areas. These seriously need to be in free-roaming 3D. Hyrule Market needs to be like Clock Town, although I don't expect it to be as big. There should be people walking around and doing different things at different times of the day. And it would be awesome to see them walk from what they do in the day to what they do at night with OoT's night and day system. I want to see more real time action. Exploring the back alleys and side alleys in 3D, as opposed to pre-rendered, would also be great, and perhaps they can expand the town a bit. And perhaps we can link the Temple of Time to Hyrule Castle. My idea is an alternate branch to get into the Castle to first see Zelda, ala the sewers connecting Hyrule Castle and the Sanctuary in ALttP. I'd really like to see Hyrule Castle expanded as well, in the same glory as it was in ALttP. Yeah, there should be a few more things going on in the Village, and I definitely want to see it as a mini-Clock Town. And bring back the Black Smith. There should be one either here or in Hyrule Market. Throw in some interactive NPCs going form Hyrule Market to Kakariko Village. There is opportunity to tie together areas. I already covered some of that with Zora's River, as it can provide a nice travel-way from Gerudo Valley to Lake Hylia. However I think Death Mountain should have a pass that goes to Hyrule Market. You can see Death Mountain at the Temple of Time, so perhaps that would be a place for it. And through all of these area expansions there are tons of ways to expand the sidequests, explore NPCs more deeply, and add new gameplay features found in later Zeldas like WW and TP. Link should be able to use more than just his bow when riding Epona. This would also provide an opportunity to introduce some more enemy varieties. Some of the unnecessary weapons should have more uses, such as unlocking secrets and areas. The Ice Arrows could get more action. I never used Farore's Wind. There wasn't much of a need for Nayru's love. Bombchu's could be better utilized. And the boomerang. WTF. The boomerang has been a staple for Link yet it gets very limited use. We should have access to it as an adult. The same for Deku sticks. Yeah, we go around and save every other area from evil but we can't save Zora's Domain. It can be done and we should be able to do it. While not being able to do this in the original adds a bit of a dark element to the game, we can still have our cake and eat it too. Not all the Zoras have to survive the unfreezing. There's an excellent opportunity to add character depth at Zora's Domain. And perhaps we use the Sun's Song to remove darkening clouds, allowing rays of light to melt the ice. And if we ever wanted to get back to the Ice Cavern we can just use the Ice Arrows. All the dungeons should be remixed like the Master Quest. Remixing will thus perhaps allow for more items to make their way into the game or use the items already in OoT more effectively. Surely Deku nuts can do more than just stun enemies! I for one like the idea of using Zelda's Lullaby in the Water Temple, although I see many people hated it. Well yes, it was annoying to stop at the same place to change the water level especially when backtracking. A simple idea fixes this problem: Use Zelda's Lullaby at the Triforce markings, and it will reveal a floor switch we can press. That will change the water level. Nice and simple fix for that, and you won't have to replay the song at the same places. So these are just some of my ideas to make the greatest game of its time the greatest of all time. There really is so much they can do. I just hope they set their minds to do it and not just make a port with 3D effects. I really don't want them to change much. All I'm asking for is for better graphics, and a hard mode. Also...I REFUSE to have to blow into the DS to play the Ocarina. That stupid mechanic almost killed Spirit Tracks for me. I REFUSE to have to blow into the DS to play the Ocarina. That stupid mechanic almost killed Spirit Tracks for me. Agreed. Knowing Nintendo, we should probably make a thread for what NOT to do with the Ocarina of Time 3DS, and blowing on DS mic is one of them. What are you all talking about? I want to blow into the mic as my means of MOVEMENT! Think about it! 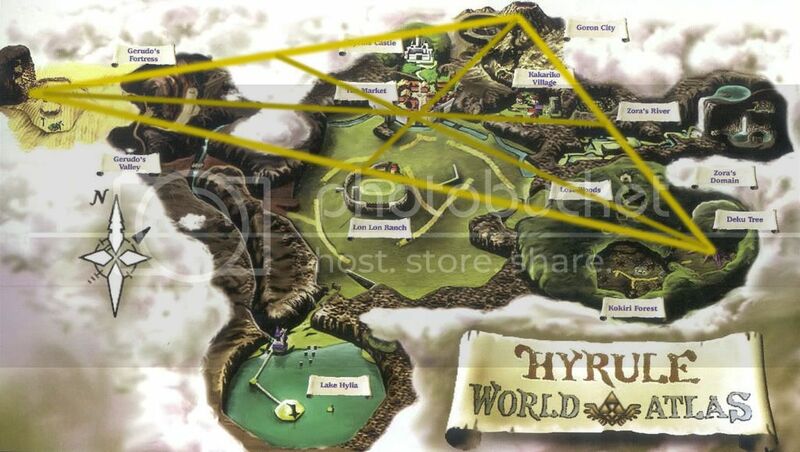 Though that map reminds me of back when everyone was trying to find the triforce and I realized that if you link the three starting temples, the center of the triangle is the temple of time. It worked out perfectly on the map I had printed off back then, but as I tried to recreate that here, it seems it's a little off. I wonder if this is just a different aspect ratio from the map I had back in the day. That's because the Spirit Temple isn't a starting dungeon you n00b. Good catch. Then that wasn't what I was referencing. Maybe I'm remembering it wrong and I was going for just the three outermost temples (obviously ignoring the Water Temple because it wouldn't make a triangle). There was a reason, and it wasn't as ridiculous as the argument I just made. I had a point back then dammit!